North Walls cottage is a charming Grade II listed period property, situated within the city walls of historic Chichester, overlooking the North Walls. It is in a quiet one-way street within walking distance of shops, restaurants, Chichester Festival Theatre and pubs; it is ideally located for the Theatre, Priory Park and Oaklands Park, with good access to Chichester Harbour, Goodwood and the South Downs. The cottage is fully furnished and would ideally suit one to two couples, or a family, looking for a city-centre base with character and ambience. 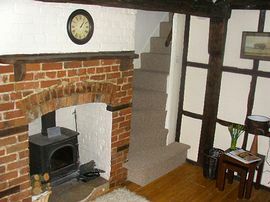 All rooms have original exposed oak beams; the lounge has a wood-burning stove, TV/DVD player, 3-seater sofa and armchair. There is a fully fitted kitchen including new fridge, freezer and washer/dryer; the dining area has a pine table and chairs. The first floor comprises bathroom with shower over bath and separate bedroom with new double bed and built-in wardrobes. The second floor is a studio bedroom, with a new double bed and futon. There is a very small South facing courtyard, with pot plants and two garden chairs. Street parking is available a few yards away and a large 24hr. car park a few minutes walk away. Within city walls of historic Chichester. All newly refurbished but maintaining 17th Century charm. In Chichester, turn next left after North Street, then left again into Orchard Street. 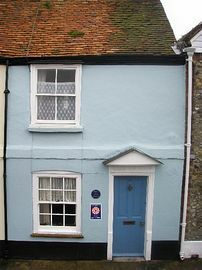 The cottage is at the top of North Walls, just off the top of North Street. £395.00 per week Low season. £475.00 per week Mid season. £550.00 per week High season. Please see our website, or contact the owner, for exact tariff for your dates. SPECIAL OFFER BETWEEN 25 MAY - 4 JUNE. All year round: Weekly lets. Out of high season: Mid-week or weekend lets.